Book Review: Managing Transitions by William Bridges | Think Differently! One of the ‘classic’ texts on Change Management is Managing Transitions: Making the Most of Change by William Bridges, originally published in 1991 and last updated in 2003. In this review, I provide an overview of the framework, and make a critical assessment of its strengths and weaknesses. Change is situational: the move to a new site, the retirement of a founder, the reorganization of the roles on the team, the revisions to the pension plan. Transition, on the other hand, is psychological; it is a three-phase process that people go through as they internalize and come to terms with the details of the new situation that the change brings about. That is: transition involves psychological change for the people involved: after a transition, people will adopt new behaviours, adapt their mental frameworks, and adopt new identities. “Transition” involves change on a personal, internal level whereas “change” may not. Bridge argues that “it isn’t the changes that do you in, it’s the transitions.” That is, it is the personal and psychological side of change related to people’s transitions that is difficult to manage rather than the explicit program of planned activity such as installing new computers or putting in place new incentive programs or reorganising a workforce. In the diagram, time is represented along the x-axis, and the proportion of management activity spent in each of the three activities is represented along the y-axis. 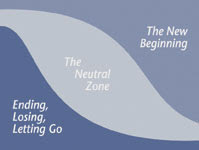 In the diagram, initially most of the activity in managing the emotional and psychological journey of transition is related to the letting go of the past and later related to investing in and transitioning to the future. Bridges key proposition is that “the starting point for dealing with transition is not the outcome, but the ending you’ll have to make to leave the old situation behind.” People can be attached to the old ways, and the transition can be initially marked by people becoming angry, sad, frightened, depressed, anxious, confused, and exhibiting bargaining behaviours. Endings can be managed by treating the past with respect, helping compensate for losses, giving people plenty of the right information, marking the endings, and helping define what is over and what isn’t. The neutral zone is a place of both risk and opportunity. It is risky because people are unsure of the process being made and may become anxious, during which time productivity may fall. Old weaknesses, compensated for in the old arrangements, may rise to the surface. People may get mixed signals between the old regime and the new, and people may become polarised one way or the other, leading to tension and discord. In addition, until the new regime becomes embedded, the new arrangements are vulnerable to internal or external shocks. For all these reasons, transitions through the neutral zone need to be managed carefully. Bridges provides a number of mechanisms for this, including creating temporary support systems and short term goals and redefinition of the activity in the neutral zone in terms of more familiar activity or metaphors. The neutral zone is also, however, a point of creative opportunity: as people and systems “unfreeze” from the old systems and have not yet “freezed” back into the new systems, there is tremendous opportunity to identify and realise changes and find new ways of doing things. The beginning will take place only after they have come through the wilderness and are ready to make the emotional commitment to do things the new way and see themselves as new people . . . Beginnings involve new understandings, new values, new attitudes and -most of all – new identities. A start can and should be carefully designed . . . A beginning can and should be nurtured, like a plant. Starts take place on a schedule as a result of decisions. They are signalled by announcements . . . Beginnings, on the other hand, are the final phase of this organic process that we call “transition,” and their timing is not set on the dates written on the implementation schedule. Beginnings follow the timing of the mind and the heart. In order to manage beginnings, Bridges suggests it is necessary to first manage the endings and neutral zones. In addition, transition managers must define the “4P’s” defining the path into the future: the purpose of the transition, the picture or vision, the plan, and the part for each person to play. In addition, being consistent (avoiding conflicting messages), building momentum with “quick successes,” symbolising the new entity, and celebrating successes can all help with successful transitions. Determine how people will be affected – who will have to let go of something? Beyond these losses, is there something that is over for everyone? Another useful recommendation is that Bridges proposes the creation of a Transition Monitoring Team – a group composed of individuals from across the organisation holding various roles, whose sole purpose is to provide a feedback on the status of the transition across the organisation. Bridges framework for managing transitions has many strengths. Bridges puts management of the human side of change at the forefront, and highlights the psychological and emotional component of change. In addition, the book is full of insights and tools culled from Bridges’ experience as a consultant helping organisations manage transitions. Bridges’ Managing Transitions is deservedly a classic in the Change Management literature. However, there are several weaknesses that deserve mention. First, the language used to describe Bridges’ key concepts often does not facilitate sending his message as clearly and unambiguously as it could. For example, the phrase “the neutral zone” is (to my mind) somewhat ambivalent and meaningless: a simple change to perhaps “the transition zone” or even something more poetic such as “the long dark night” might be more meaningful to readers. Similarly, the fundamental distinction between “change” vs. “transition” and “starts” vs. “beginnings” is not as sharp as it could be, and consequently the reader needs to expend more effort to determine exactly what Bridges means by these central terms in his framework. The third and fourth issues are that Bridges does not clearly relate the management of change to the management of transitions, and that Bridges emphasis that managing transitions starts with letting go of the old. Clearly a great deal of planning is typically done to manage changes: how should these or do these inter-relate with the management of transitions? Both these issues can be highlighted by considering an organisation undergoing change in a managed fashion. Before change is implemented, the change has typically been planned, stakeholder impacts have been analysed, the roadmap has been laid out and communicated. The “4P’s” of purpose, picture, plan and play laid out in Bridges’ third stage of “beginnings” have been well developed and extensively communicated. That is, the management of change is typically well advanced well before anyone needs to start letting go of anything and begin transitioning to new arrangements and identities. From a change management point of view, Bridges’ model is temporally out of order. In addition, once the change is announced, people are immediately exposed to the new possibilities, the purpose, the new vision and the new roles and people may begin to see themselves in these new roles and behaviours. That is, transitions can start equally as much with beginnings as with endings. Demanding that transitions must occur in a definite temporal order is unrealistic and may retard rather than help develop an understanding of the transition process. Similarly, for transitions purely on an individual level, take the example of someone transitioning to a new job. In terms of change, the process may start with planning their new role and identity and making the mental shift towards being potentially in a new role. This may be followed by applications and interviews in which the possibilities become progressively more tangible, followed by their appointment into the new role. Only well into the process – after appointment to the new role – is the old role released. However, the transition to the new role may not be completed until arriving in the new role and settling into new relationships, expectations and responsibilities. The point here in even this simple example is that the transition may well be well developed at an early stage of conceptualising new roles and identities well before releasing the old, and the inter-relations between the management of change and the management of transitions may be quite complex involving internal psychological states, constructions, attributions and emotions. A fifth shortcoming of Bridges’ framework is that while Bridges emphasises individual psychological transitions, including grief related to the loss or ending, and the need to develop new identities, behaviours and understandings, Bridges’ framework does little to discuss the sociological and cultural dimensions of change for an organisation. Major change typically impacts not only individual people but also cultural shared values, behaviours, and collective identity. Bridges does not detail how these shared characteristics are influenced and evolve during transition, and keeps his framework centred on the level of managing individuals though transition. Bridges framework is full of insights and remains a highly useful framework for conceptualising and managing change (ok, transitions) for both organisations and individuals. It is a vital component in any change manager’s toolkit. However, critical assessment of the framework can lead to fruitful directions for further developing, extending and applying it. Absolutely brilliant. I am learning on Transition and how it does affect some people and that we have to put ourself in there position and understand the affect it does have but also look at the positive side of how we can improve and make it simple and apply the best practice in those circumstances.